Get your creative juices flowing in this 2 hour workshop to introduce you to the art of needle felting . 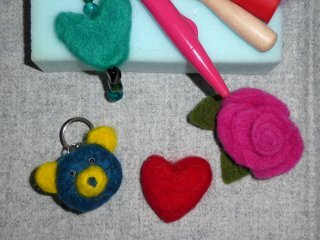 We will guide you through the basics of this therapeutic and addictive craft and then you will go on to make a Bear Keyring or a Flower Brooch to take away with you. The course fee includes tuition, materials and refreshments and take place at The Purple Pumpkin Patch in Loughborough. You can book your space by visiting the shop or by phone on 01509 237693 or via the Wobbly Pins website .